PTScientists is working with Professor Sergio Montenegro and his team at the University of Wuerzburg on a number of different technologies, including a computer operating system that will be used on ALINA and the Audi lunar quattro rovers for Mission to the Moon. RODOS – the Real-time Onboard Dependable Operating System that Prof Montenegro has developed – reduces complexity to achieve higher dependability, making it perfectly suited to use in situations where you require system reliability, such as in pacemakers (one place you might find RODOS in operation). High dependability is also essential for spacecraft, which is why we feel that RODOS is a perfect fit for Mission to the Moon. In fact, RODOS is already in use in several space missions, including BIRDS, Beesat I & II, and BIROS. PTScientists is working with Prof Montenegro to optimise RODOS to meet the specific needs of our mission and ensure compatibility with the up- and down-link from the ESTRACK network of ground stations. This requires a special module for encoding and decoding CCSDS data packets, and we have partnered with the University of Wuerzburg to develop this. 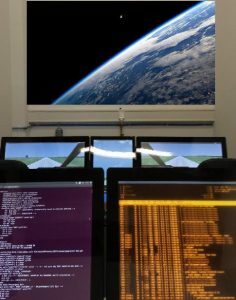 In addition to the work on RODOS, the University of Wuerzburg is also supporting PTScientists with the development of software “building blocks” that sit on top of RODOS to control the spacecraft and ensure a smooth mission. Driving a vehicle that is thousands of kilometres away from your location is not an easy task, especially with signal delays adding another layer of difficulty. Prof Montenegro’s team have built a so-called “Remote Cockpit”, to assist rover operators working on the ground. Vehicles. It has telemetry displays and a command console, plus two pilot interfaces like in the cockpit-2020 concept. Combining the three major elements of rover control – monitoring telemetry, sending commands and driving – it allows pilot, commander and engineering support to work alongside one another in a truly collaborative manner. Originally developed as prototype for situations requiring high manoeuvrability and dynamic control (such as controlling drones or docking manoeuvres in orbit), PTScientists will use it to control our rovers on the Moon – giving the remote cockpit its first test on a real space mission.